The Paschal season of the Church is preceded by the season of Great Lent, which is also preceded by its own liturgical preparation. The first sign of the approach of Great Lent comes five Sundays before its beginning. 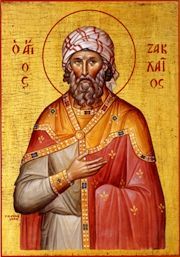 On this Sunday (according to the Slavic Lectionary and sometimes according to the Greek Lectionary for which it is the Thirtieth Sunday After Pentecost), the Gospel reading is about Zacchaeus the tax-collector. It tells how Christ brought salvation to the sinful man, and how his life was changed simply because he "sought to see who Jesus was" (Luke 19:3). The desire and effort to see Jesus begins the entire movement through Lent towards Pascha. It is the first movement of salvation. Saint Zacchaeus is primarily commemorated on April 20.